From random facts to courses from top universities, the Internet is full of places to learn. The key is knowing where to find them. HelpTeaching.com offers a large selection of free online self-paced lessons for math, science, social studies, and English, but there are many other resources out there as well. We have gathered links to help kids in grades pre-K through sixth grade learn online. The 70+ resources are organized by type (videos, online courses, reference materials, and more). Kids can learn by exploring these resources on their own or teachers can incorporate them into lessons to help enhance learning in the classroom. Magic Keys has made a wealth of storybooks available to kids. Storybooks are organized by age level (younger children, older children, young adult). It’s one of the few story sites out there that doesn’t just focus on younger readers. Many of its stories also feature character lessons for kids, making them even more beneficial for kids! Most public libraries now offer free access to eBooks only, but you typically need a library card to access them. These resources offer kid free access to quality textbooks, non-fiction eBooks, and important documents – no library card required. International Children’s Digital Library provides access to thousands of free digital books for children. These books come from around the world, making it easy for kids to find fairy tales, folklore, and other resources to help them explore different cultures. Reading Bear offers free learning resources for early readers, including presentations on short and long vowels. The fun presentations are all free and cover all major phonics rules. Unite for Literacy offers many read-alouds for kids. Most of the books are non-fiction picture books that focus on using simple sentences and key vocabulary words. StoryJumper has a library full of digital fiction and non-fiction books for kids. It also gives kids the opportunity to create their own books. National Geographic Life offers reading passage for kids at beginner/elementary, pre-intermediate/intermediate, and upper-intermediate/advanced levels. Passages feature audio recordings and reading comprehension questions. 100 Milestone Documents introduces kids to 100 documents that play an important role in American history. Through this site, kids can access the text of documents such as the Declaration of Independence and the Patent for Cotton Gin. Scholastic: Listen and Read features 15 non-fiction books to help kids learn about people in their community, animals, and the job of the president. Audio is provided to help kids as they read. Literacy Wagoll teaches kids “what a good one looks like” by providing them with samples of exemplar writing. A variety of essay types and other styles of writing are provided. You don’t have to pay for expensive tutors or pay the tuition to an Ivy League university to get kids access to high-quality courses. These resources feature courses put together by top universities and other experts in the field to help kids learn about a whole host of subjects. Whether kids want to learn how to solve complex math problems or learn how to play the piano, there’s a free course available. HelpTeaching.com’s own collection of math, science, and English lessons combines entertaining video and text-based lessons with short, interactive quizzes. Teachers and parents can choose lessons for kids to complee on their own or can incorporate them into whole class and small group based lessons. Lessons are organized by subject, grade-level, and length. Teachers and parents can also create their own tests and quizzes to accompany the lessons, and then administer them using our Test Room feature. Starfall is a free resource designed to teach kids to read. By watching its free videos, listening to the songs, and reading the short stories, kids may even learn to read on their own. E-learning for Kids features a wealth of free lessons for kids in many different subject areas. Access to lessons is available in five different languages. Kidastronomy.com offers two free astronomy courses for kids. One is for ages 7-11 and one is for ages 12-18. Both courses teach kids all about astronomy. English Grammar 101 is full of free grammar lessons for kids and adults. Lessons are also great for ESL students. Plural Sight works with Scratch and other coding programs to provide kids with free technology lessons. Kids can also learn about photography and website building with the free courses. Youth Digital is focused on helping kids ages 8-14 build their tech skills. With their free online courses, kids can learn how to code, program, and creatively use technology. Code.org has gained a lot of recognition for its free coding courses. Even the President has completed an hour of code and your kids can too. Kid Courses is an organization focused on presenting free online courses for kids. Its standout lessons are called MathLibs, but they also offer lessons in art and rhetoric. Canvas Network is a collection of MOOC courses from universities around the world. Many of the courses it offers may be of interest to upper elementary and middle school students too. DiscoveryK12 is a free learning portal for homeschool families. 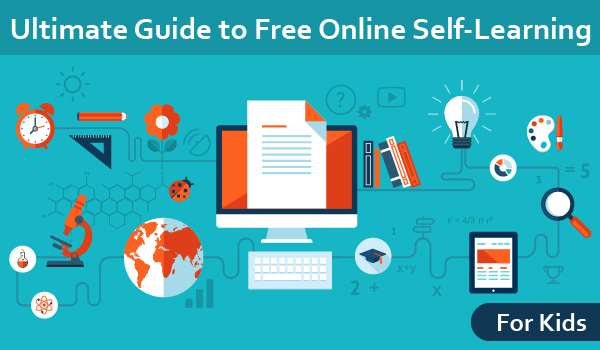 An account is required, but all course materials are completely free. LearnZillion focuses on presenting engaging video lessons to teach the Common Core. Creating an account is free and gives kids access to all of the lessons. Kids Guitar Zone helps kids who want to learn to play the guitar do it for free. The site features 10 lessons to get kids started. ChessKid is designed to help kids learn to play chess online. With this site, kids get free chess lessons and can test their skills against other kids from around the world. Grammar Monster has a large collection of free grammar lessons and activities to help kids learn about punctuation, parts of speech, and other elements of grammar on their own. While the majority of the lessons are appropriate for kids, a few do contain references to adult subjects (namely quotes involving alcohol), so parents and teachers should preview lessons before assigning them to kids. Curriki features free curriculum resources created and approved by teachers from around the world. Parents and teachers can use the resources to create their own lessons or kids can review the resources to learn on their own. CoolMath offers free interactive lessons for pre-algebra, algebra, and pre-calculus. Not only are the lessons fun, but the site also offers a host of free math games for kids to play. AAA Math offers free online math lessons for kids. Lessons cover a variety of grade-levels and skills. Hoffman Academy offers 100 free piano lessons for kids. Each lesson is accompanied by practice opportunities. Free Piano Lessons for Kids features 22 lessons designed to teach kids how to play the piano. Kids will learn how to sit at the piano and even how to play a few songs. CK12 is an awesome learning portal for kids. It combines videos, textbooks, and other lesson materials to help kids learn online. This resource is a high-quality, interactive site for kids. It offers fun simulations, plenty of practice opportunities, and other activities designed to motivate kids to learn. We especially love the BrainFlex challenge which encourages kids to build their skills while they’re out of school. Videos appeal to video and auditory learners. Some videos bring experts in a field directly into the home or classroom. Other videos use creative strategies and images to help kids learn difficult concepts and skills. The skills don’t have to be academic either. With videos kids can learn how to cook, how to crochet, or even how to ride a bike. EarthCam gives kids access to webcams from around the world. They can see what is going on live at thousands of destinations. Kids at this age can’t drive and parents often don’t have the time or resources to travel around the world with their kids. By looking at the webcams, kids can experience the world in real-time without leaving the house. Universal Kids allows kids to watch episodes of some of its most popular shows. PBS Kids videos give young kids access to episodes of some of their favorite PBS shows. The best part is that these shows are also educational. Super Simple Learning is a company focused on creating educational songs for kids. Their website features free videos of many of their songs. Khan Academy gives kids one piece of information, “you can learn anything.” It gives them the opportunity to learn with thousands of videos on a variety of topics. WatchKnowLearn features free educational videos organized by subject area. Parents and teachers will also find videos aligned to the Common Core State Standards. NEO K12 is a site full of educational videos on topics ranging from physical science to ancient history. Games and lessons are also included to help kids learn even more. YouTube EDU highlights some of the most educational videos available on YouTube. Videos are available for kids in early elementary school all the way through college. BrainPop is a staple in many schools. While access to the full site requires a subscription, kids can still watch many of the fun videos for free. TeacherTube is a website similar to YouTube. The difference is that all of the videos are designed to be educational. Explore.org encourages kids to explore the world through webcams. Kids can view live webcams from around the world or watch informational films. The Kid Should See This is focused on providing high-quality educational videos for kids. These videos focus on innovative technology and other cool ideas. My Education Key features video lectures from colleges and other educational institutions. Content covers a range of age levels from kindergarten through college. MIT K12 gives kids a look at science in the real world through its collection of videos. Make Me Genius helps kids learn about science through free videos, PowerPoint presentations, and other resources. If kids want to conduct research using an encyclopedia, they no longer have to search for the correct volume, looking up the definition of a word doesn’t require thumbing through a massive dictionary, and most kids today have never even seen an almanac. All of these resources, which are chock full of information can be accessed for free online. Awesome Library has organized thousands of high-quality resources for kids. They can explore by topic or keyword to find information they need. When kids use a standard search engine, you can’t guarantee the results will be kid-friendly, but all of the resources that appear in an Awesome Library search have been reviewed and approved. This gives kids the freedom to search for what they want in a safe space. Enyclopedia Smithsonian takes the Smithsonian’s amazing collections and turns them into an interactive encyclopedia. Kids can search by keyword or browse by topic. Encyclopedia Britannica is one of the top encyclopedia companies in history and kids can access its content online. The site also includes the most current world news. DKFindout! takes the content from DK readers and makes it more interactive. Kids can learn about a whole host of topics in an encyclopedia style. Again But Slower takes a Wikipedia page and simplifies it to make it easier to read. Internet Picture Dictionary looks simple, but it’s a great free dictionary designed to help kids learn new words. It’s particularly helpful for kids learning English as a second language. Visual Dictionary Online gives kid a new view of the dictionary. They see words connected to images which helps them make connections and gain a better understanding of key words. Merriam Webster is one of the leading names in reference sources. Its online site gives kids free access to a dictionary, thesaurus, and more. BigIQKids Dictionary features many of the key words kids need to know. It also speaks each of the words. Boolify helps kids learn how to conduct more successful online searches using fun puzzle-style pieces. Infoplease.com is an virtually every type of reference book all rolled into one. Kids can also find a calculator, spell checker, and other key resources. Safe Search Kids performs a safe Google search for kids and also offers internet safety guides for kids, parents, and teens. Kiddle offers a safe visual search engine for kids with websites, videos, images, and kpedia entries in the results. Owl & Mouse – Atlas introduces kids to the world through maps and facts for every country. Farmer’s Almanac for Kids makes the traditional Farmer’s Alamanc accessible to kids. It features information on the weather and resources to help them learn about the world around them. Learning doesn’t always have to have a particular focus. Sometimes kids learn the most just by hearing random facts and bits of information. These small morsels of knowledge don’t only serve as conversation starters, they can also inspire kids to want to learn more about a topic. FAQ Kids gives kids a place to find answers to their questions. Questions are organized by category. The site itself is simply designed, but the answers are anything but simple. Many of them are 2-3 paragraphs long and contain facts to back them up. Duckster features short encyclopedia-style entries on many different topics. All are written in kid-friendly language. DLTK’s Crafts for Kids is more than just crafts. It’s a site full of educational printables and other information for kids, along with fun crafts and activities. Squigly’s Playhouse gives kids a place to play and learn. They can learn through games, fun facts, or crafts and activities. ScienceKids.co.nz is focused on helping kids enjoy science. They’ll learn facts about a variety of topics and find fun experiments to complete. FactMonster is full of facts for kids. Facts are organized by topic and there’s even a special homework help section. Facts for Kids helps kids learn unique facts about people, places, history, and animals. KidsKnowIt is a collection of websites and educational games for kids. By browsing the sites, kids can learn a lot. Globaloria teaches kids about the world by encouraging them to design games of their own and to play games created by kids. Fun Trivia is a quiz site designed for kids and adults. Kids can learn all kinds of facts by taking many of the fun quizzes on the site. Kids World Fun features lots of tips for kids, a “Did you know?” section, and even quotes of the day. Cool Kid Facts introduces kids to fun facts on a variety of topics. Kids can learn about science, geography, history, or animals. Funology wants kids to have fun. It provides them with recipes, experiments, and facts to help them have fun while learning. Do you have any favorites from the resources above? Share them in the comments! yeah this idea can change kids think of view about get education. even kids well never know that they are learning something while they are reading of playing games. Scratch Garden is a reputed Canadian website that provides innovative ways to educate children.